The long wait for a solo Black Widow movie may not be over yet, but at least there's daylight over the horizon. Marvel finally pressed ahead on giving Scarlett Johansson's stealthy Avenger her own movie, and who knows? Maybe one of those recently revealed release dates will belong to it? Johansson has always been down with the idea, supported by Marvel's Kevin Feige, Robert Downey Jr., and more. Now as she's out doing press for Avengers: Infinity War, Johansson talks about what a Black Widow movie could achieve for the character. If Infinity War turns out to be as cataclysmic as it's been hyped to be, then this may be the perfect opportunity for Black Widow to split off and do her own thing. Something tells me Marvel sees the opportunity for that, too. The most important question before a Black Widow movie is, "Will her hair be red or blonde"? 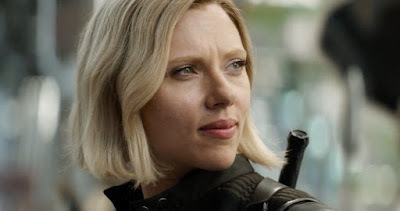 Natasha Romanov's signature crimson locks are decidedly different for Infinity War, causing her to resemble the evil blonde Black Widow from the comics. So what's up with that? Why the change? Johansson tells Comicbook.com, "Joe and Anthony really wanted our characters...wanted us to, kind of, feel like it had just been a period of time when we were both, sort of, under the radar just like different. I think that red hair is a, sort of, signature of Natasha. They just wanted us to look different. So for me I thought, 'Alright well maybe I'll give a wink and nod to the other Widow's story that have been out but with her.'" "Well it's been a long period of time and, again, I think she's not a particularly sentimental person," Johansson said. "And I think she understands that it's been a period of time and they've both had their own experiences separate of one another and always have like a shared experience with one another but, again, a lot of time has passed and I think they both kind of made a sort of heroic decision the last time that they saw one another that they were that they were going to sacrifice their own personal desire for the greater good and that's how they could move on." Will they ever get back together? We'll find out when Infinity War hits on April 27th, assuming Black Widow doesn't get chucked from reality by Thanos.